I have been back to my usual bread-making routine for quite some time, you don't get to see much of my homemade bread here as I have trouble trying to keeping up with my blog posting. I definitely bake faster than I could blog! For the past week, I have made mini-polo buns, a wholemeal raisin loaf and the latest is this Bacon & Cheese loaf. As usual, I used my bread machine to do the kneading...it was almost like making a plain sandwich loaf, except for one little extra step of pan-frying some bacon. It could be due to the 'cold' flour (I stored it in the fridge) or the temperature of the water, this dough took quite a long time to rise, especially during the 2nd proof...it was almost 2 hours later before I could pop it into the oven. Other than a slightly 'shorter' loaf than usual, the end result was very satisfactory. I went weak the moment I unmolded this loaf and removed the parchment paper. It was baked to a gorgeous golden brown all over...the aroma from the loaf freshly out of the oven was simply irresistible! 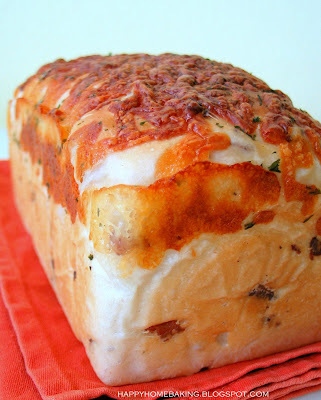 It was a joy eating a slice of this bread...the bacon bits and mild peppery taste from freshly grounded black pepper was a match in heaven...not forgetting the savory melted cheese on the crust. The bread kept well too...which I have stored in a Lock & Lock bread container. Since homemade bread tends to 'age' faster, keeping them in air-tight container is the best solution. The bread was still soft on the 3rd day and I toasted the last slice, which I saved just to test the texture...and it tasted just as good. Pan-fry finely chopped bacon over low heat, until brown and crisp. Drain off any excess oil and mix in the black pepper. Set aside to cool. Place all ingredients B, except the butter, in the pan of the bread machine (according to the sequence as stated in the instruction manual of your bread machine). Select the Dough function of the bread machine and press start. After about 8mins of kneading (the ingredients should form a smooth dough by now), add in the 20g of butter. Let the machine continue to knead the dough. After the kneading cycle has stopped (20mins), Stop and Restart the machine. Continue to let the machine knead for another 10mins. Add in the bacon and black pepper mixture and let the machine run for another 1~2 mins until the bacon mixture is incorporated into the dough. Stop the machine and remove dough from the bread pan. Shape the dough into a smooth round and place in a lightly greased mixing bowl, cover bowl with cling wrap and let dough rise till double in volume for about 80 ~ 90 mins. Remove dough and give a few light kneading on a lightly floured work surface. Press out the trapped air as your knead. Shape into a round dough and cover with cling wrap, let the dough rest for 15mins. Flatten and roll out the dough into a rectangular shape (20cm by 15cm). Roll up swiss roll style and pinch the seam in place. Place dough in a loaf pan (size, 7.5"x4"x4", lined with parchment paper, both bottom and sides), seam-side down. Cover with cling wrap and let dough proof for 50~60mins or until the dough reaches about 90% of the height of the pan. Sprinkle top with grated cheese, black pepper and some dried parsley. Bake at preheated oven at 190 degC for about 30mins until the bread is golden brown all over. Cover the top with a sheet of aluminum foil if the surface browns too quickly. May I know where you bought your bread flour from? I do not like Phoon Huat bread flour as I find its not as good as those from USA or Canada or UK. In fact the texture is disappointing. Cold Storage used to stock the Made in Canada white bread flour specially for baking bread without need of bread machine, that was the best bread flour ever, unfortunately they no longer carry this brand. oooh that looks delicious! 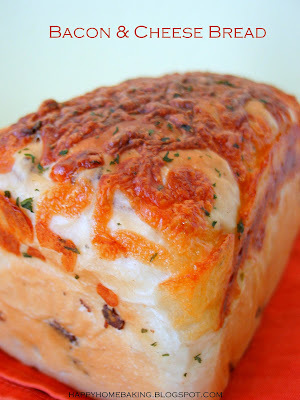 i've had a recipe for a bacon and cheese loaf i've been wanting to try for a while too, it sounds delicious. Hi Anonymous, I usually use Prima bread flour which is easily available from most supermarkets. I also use "Gold Medal" bread flour which is only available at certain cold storage outlets and sometimes I do see them at NTUC. It is unbleached and is formulated from higher-protein wheat. Wow i just finished baking a bread too! my first ever baked bread. but my ctrust is very hard and inside is ok. any tips for this? would love to try with cheese one day too once ive succeeded! Your bread looks beautiful! I think it's hard to go wrong when it involves bacon. Mmm, this bread looks fantastic. Cheese and bacon are a match made in heaven. I've been on a bread kick lately, so I can't wait to try this bread. Your pictures were making my mouth water! Bacon and cheese, perfect match! I can smell the aroma from my computer screen (tee tee). Your bakes are delicious looking as ever. Your blog was one of the blogs that inspired me to start blogging again. I was wondering how you make those little categories of brownies, jams, dessert etc. as I would love to add them in my blog. Thanks for being an inspirator! The bread looks great, I've the recipe book too. Will try this one once I'm free. I like the way you took those pictures, good job! I would like to try full cycle in the breadmachine. Is it advisable cos I've not bought my pull man tin. If so, what function is best... dough or sweet function ? Wahh!! Your bread looks really tasty. I've not tried this recipe yet, your one looks better than the book one, very nice! Hi Missy, as many factors can affect the outcome of a homemade bread, I am not able to give any comment...but I would think the hard crust is due to your oven or did you bake it using a bread machine? You can add the categories by going to the 'Page Element', then click on the 'Add a Gadget' link, and select 'Link List'. You will have to add in the link for each of your blog post. Hi Ling, the DOUGH function will only do the kneading and proofing. It will not bake the bread. You can select the BASIC function for this recipe. Hi Grace, do try it, I am sure you will like it! You are my bread guru. tee tee. May I check with u what model/brand of bread machine you currently using? I am thinking if I shall get myself a bread machine or a bigger mixer to do the kneading, what do you think? I realize you either knead by hand or by bread machine, never use cake mixer to do the kneading. I'm definitely up for anything involving bacon! Looks great! Hi Aimei, I like the crust too! Hi Manuela, thanks for visiting! Hi Let's masak, my bread machine is under carrefour's housebrand, Bluesky. I don't have a standing mixer, I only have a hand-me-down, handheld electric mixer, which doesnt come with a dough hook. As such I either use the breadmachine to knead or knead by hand. It depends on your usage, if you prefer to shape the bread dough and bake it in your normal oven, then it will be better to get a mixer which comes with a dough hook. If you prefer to bake loaves and would always use the full cycle, ie knead, proof, bake; then you can consider a bread machine. wow that look really great, makes me want to bake somethin right now. can we use cheddar cheese for topping? I saw anather blogger using Bluesky brand also. I will check it out. My mixer comes with dough hook but the capacity is too small, only 180w, not enough strength but bigger mixer (such as Kenwood chef) cost a bomb, in this bad economic got to think twice. i have seen so many yummy bread around, i wanted to be able to bake bread just like you ladies. I do not have a bread baker machine. Any recommendation where to buy one for home-use. thanks. yoour bread looks yummy, i m going to buy one from a bakery later for teabreak !! Hi Jackie, I bought my bread machine from Carrefour, under it's house brand, Bluesky. It is a basic bread machine. You can check the bigger departmental stores like Tangs, Robinsons for other brands. I also copied this recipe, looks so yummy! I made three times the honey buns. The first one, I forgot the milk!! Unbelievable! haha Looked like a pebble! terrible! But I tried again. It was good, but not like yours, so light and soft. So, I tried the third time and I got it!! The dough is really awesome! The taste is delicious! can one hand knead this recipe? Hi Ashanti, yes, you can knead this by hand. As the dough is quite wet, you may take 20-30mins of kneading until the dough becomes smooth and non-sticky. This bread looks incredible! The topping looks fantastic :). I made this bread today at my boyfriend's request and it turned out perfect! I added pine nuts, though. Just sprinkled them on the dough before I rolled it up. Love your blog, btw! I'll definitely be making more of your goodies. I've been following your blog for quite awhile now, and you are truly my inspirational baker. I made the hearty tuna buns couple days ago, and they were fantastic. Am now looking through your blog again to source for more bread recipes. 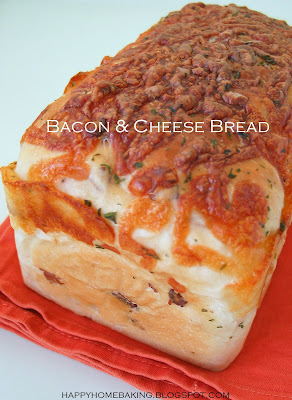 I wonder if the bacon and cheese bread can be shaped into small bread rolls? I gather I will have to bake them at lower heat and shorter timing, but will the shape change the taste of the bread? Appreciate your reply. Again, thanks for posting such great recipes, pictures and stories. And keep them coming. Hi Rach, I have not tried making this into buns. If you were to shape them into small rolls, you can try bake at 180degC for about 15mins or until the surface turns brown. 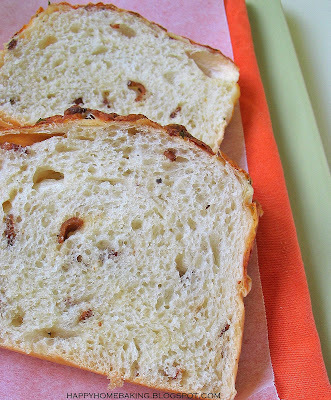 Usually a loaf bread will give a lighter, softer texture as the dough is allowed to expand more, whereas a bread bun will tend to have crumbs that are more compact. So what I usually do is, I will only make bread buns if I want to wrap with fillings, if not, I will make it into a loaf. I will choose a plain slice of bread over a plain roll/bun. Hope you get what I mean? Fantastic, actually I am a learner of culinary art and getting help from T.V. shows, and internet. I read your blog and really like it very much and feel that it is very helpful for me and every one who want chef education. Thanks a lot for share and keep it up.